When you live on a small island (8 miles long by 3 miles wide) you have to get creative with daily life functions…like exercising your dog. I was dog-sitting for some dear friends a few months back and part of the daily routine was to exercise their beautiful pup. Since she is young, she loves to run. Not just run, but run against the speed of the golf cart. So, I hop on the golf cart (also my neighbors) and call to Lacy (their pup) to hop on. She sits beside me and we head out toward the airport. Once we get to the airport, we head out onto the tarmac and once I stop the cart and say, “Okay”, Lacy knows she can get off and start sniffing. She sniffs around for a bit and then I gun it! Away I go. Pedal to the medal. Maxing out the golf cart at 25 mph. Lacy is racing alongside me. Some people bring their dogs to dog parks to get some exercise. Some people bring their dogs to airport tarmacs. 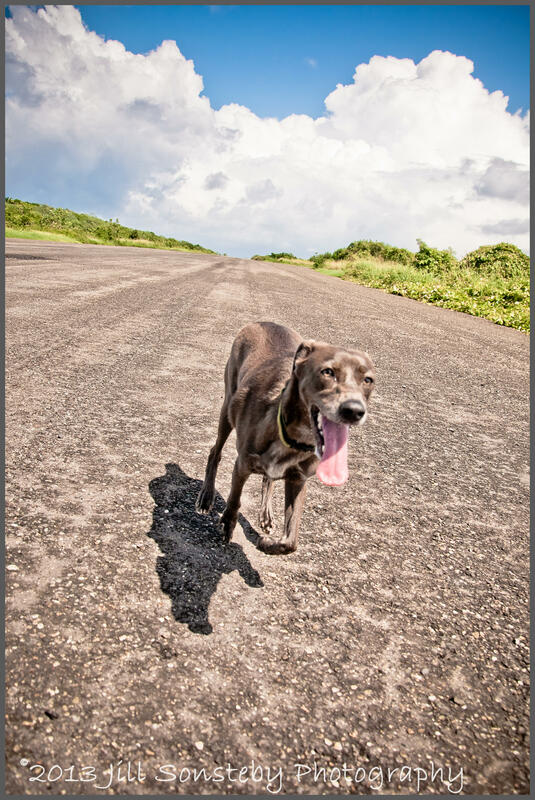 Dog running on airport tarmac on the island of Utila. Sounds like such fun, golf carts and racing dogs!